This is an ideal Desert getaway for a couple or small family. This private, stand-alone Rancho Mirage house features mid-century design, a pool & hot tub, mountain views both back & front, and privacy from all directions. The home is light, bright & airy inside with a circular driveway, car port, grass front yard, iconic mature palm trees, and landscaping in both front and back. The house is welcoming while giving guests the luxury of privacy both inside and out while maintaining natural light from both north & south. The large front yard features a front patio with mid-century furniture to sit outside and enjoy spectacular mountain and palm views. In the backyard, the clear & bright pool features outdoor furniture for sun bathing, barbecuing, or eating at the large stone table in back. Then, in the evenings, relax with a glass of wine while either soaking in the 2-person hot tub or sitting around the fire pit while enjoying mountain vistas and tranquility that only the desert can offer. Inside, you will find a large living room with an iPod-compatible sound system, period-correct mid-century furniture (including an Eames lounge chair), furnishings and artwork. The dining room features a large oval dinner able that seats six for a nice dinner party with friends. The kitchen has everything you need, including an updated stove, full-size stainless steel refrigerator/freezer, as well as a newer washer & dryer and a high-top breakfast nook table with three stools. Next is the family room that features a low profile white leather mid-century sectional sofa, relaxing chair, wine rack, and hutch filled with 200+ films. The room also has a large screen TV, DVD player, Apple TV, & FireTV for all of your viewing options. The Master bedroom has a king-size bed, and is flanked by Danish wood side tables & matching dresser. The guest room features a comfortable adult-sized "full over full" bunk bed suitable for adults, teens or children. Both rooms have flat-screen televisions w/DVD players. The Master bathroom has a shower while the guest bathroom has both a shower and bathtub. Both showers have glass enclosures. Come stay at your Desert Mini-Estate Getaway from home! 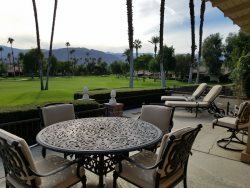 This home is located in a quite neighbor in the Tamarisk West area of Rancho Mirage. No pets or smoking please! 5 Star ***** Great place to kick back and relax for a few days. Nice weather for the pool! Close to shopping, restaurants and casinos.